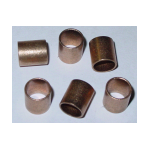 Ten oil impregnated bronze sleeve bushings are used to repair all 3/8" throttle shafts and badly worn secondary throttle shafts on the Rochester Quadrajet carburetors. Application: Carburetors with 3/8" throttle shafts. A 35 rod has a large diameter of .035" and a small diameter "power tip" of .026". The .035" section of the rod is positioned in the metering jet during light throttle driving. During heavy acceleration, manifold vacuum decreases allowing the power piston to rise positioning the small diameter (.026") power tip in the metering jet. A 37 rod has a large diameter of .037 and a small diameter "power tip" of .026". The .037" section of the rod is positioned in the metering jet during light throttle driving. During heavy acceleration, manifold vacuum decreases allowing the power piston to rise positioning the small diameter (.026") power tip in the metering jet. A 39 rod has a large diameter of .039" and a small diameter "power tip" of .026". The .039" section of the rod is positioned in the metering jet during light throttle driving. 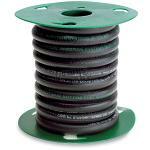 During heavy acceleration, manifold vacuum decreases allowing the power piston to rise positioning the small diameter (.026") power tip in the metering jet.